Quai (or quay), according the merriam-webster dictionary, means: a landing place, especially one of solid masonry, constructed along the edge of a body or water. The Seine River is the heart of Paris. It flows through the center of the city and is as much an iconic symbol as the Eiffel Tower and Notre Dame. 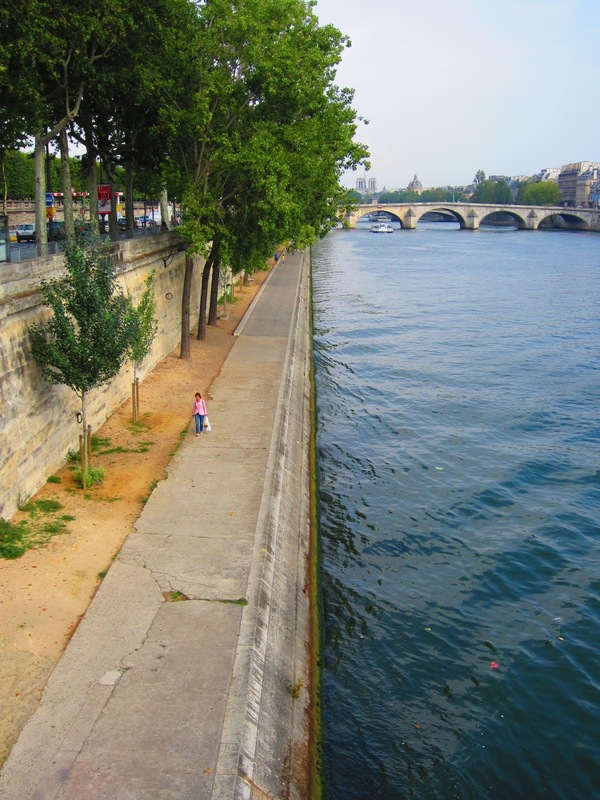 The sections of the city on the Left side of the Seine (Rive Gauche) are typically considered a bit more bohemian than those on the Right side (Rive Droite). Often directions are given in terms of which bank the address is located. 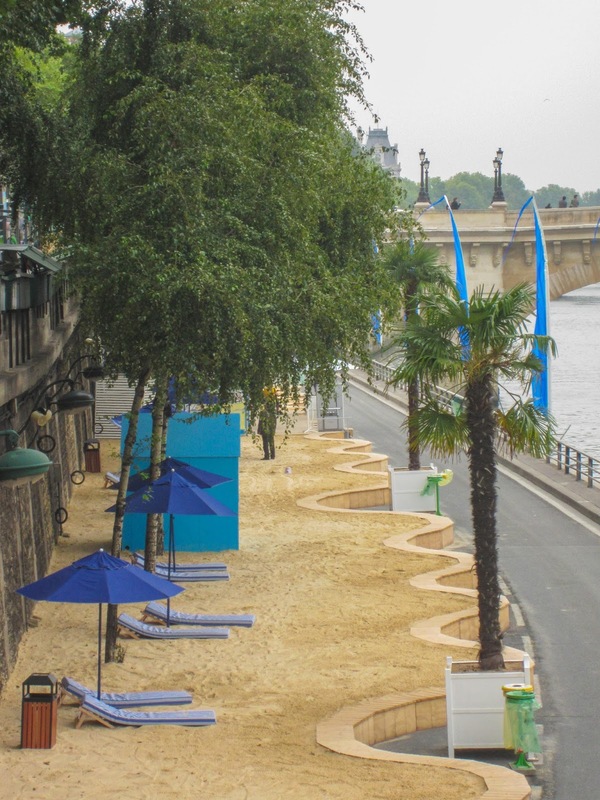 If you can escape the urban streets and get to the quai below, you will enter a peaceful oasis that blocks out the traffic, noise and crowds of the city. The pace here is slow, measured, mindful. It is quiet enough to hear the river lap against the rock wall, and yet not isolated. 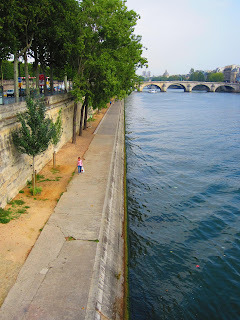 The serenity found here masks the fact that the Seine is still a major commercial thoroughfare. Whether you are looking to escape the hubbub of the city, or just want to take-in the sights from a different vantage point, a walk along the quai is a nice alternative to the normal tourist activities. As an added bonus in the summer, the city transforms some of these walks into a beach getaway. Paris Plage typically occurs between mid-July through mid-August. Over 5000 tons of sand is distributed along the water’s edge to create a magical vacation spot in the middle of the city. I wrote a detailed post of this fun, whimsical event here. But even without the sand and beach umbrellas and Palm trees swaying in the breeze, the quais provide a relaxing break from everyday life in the middle of the city. I've seen pictures of the Paris Plage before. It always seemed like a fun thing to do in Paris. I love walking along waterways in cities. They're a great reminder of the importance of waterways and commerce and why many cities arose where they did. Nice to see a different view of that gorgeous city, Paris! A trip to France is on my bucket list. Looking back over your A-Z topics just strengthens the urge to drop everything and buy a ticket. I must confess I gave that no thought until recently. I mostly considered the major rivers (like the Mississippi, the Hudson, the Thames, etc) just another landmark. I have a much better appreciation of them now. I knew nothing about it the first time I saw it (summer, 2006) but I fell in love with the whimsy of the occasion. I hope you are able to visit the City of Lights sometime soon. It is well-worth it!